The benefits of soup are even higher when you make homemade soups from scratch. Fresh vegetables and healthy foods can increase health and weight loss success. Now don’t get me wrong, canned soups are fine when you are in a rush but they do contain preservatives and chemicals when they are processed. That is why canned goods can last for years on the shelf. Preservative free and fresh is simply a wiser meal choice. Soups have to be one of my favorite meals. They are easy to make, easy to digest, low on calories, relatively inexpensive to make, are filled with fiber, nutrients, vitamins, high water content and can aid in illness. Remember back in the good old days when soup was practically a daily staple? The days when there wasn’t a fast food joint on every corner. People ate healthier meals andobesity was almost unheard of. Folks would use fresh vegetables, legumes, meats or a combination of those to make a bountiful pot of delicious tasting soup for the whole family. 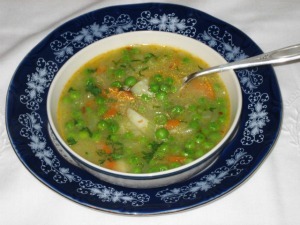 Back then the benefits of soup were not only to heal the sick, but to maintain health. Today life has become so fast paced that many of us don’t make the time or perhaps no one has every showed us how easy it is to make a fresh pot of soup. But all that is slowly changing. There are more and more soup fans growing by the number. It is catching on like wild fire. People are starting to take the time to incorporate homemade soup and broth back into their every day diets because they realize the benefits they were missing out on. As mentioned above the benefits of soup are many. They provide an excellent source of fiber, vitamins, and nutrients, not to mention fantastic for weight loss success when incorporated into your meal plans. 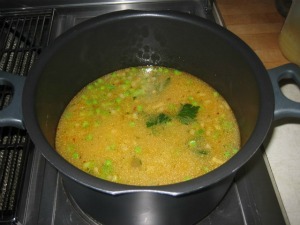 Soups and broths contain high water content and are low in calories. There is such a large variety that you can make. In fact you could probably pick a different recipe once a week and not have to make the same soup twice for a long time. We have created a collection of delicious homemade soup recipes that we hope you enjoy. There is an abundance of vegetables at your local grocery store all year long and of course at certain times of the year you can purchase seasonal produce at your local farmers market. Other benefits of soup include saving money and creative fun in the kitchen. Imagine creating your own delicious soup just by using up leftover meats and veggies in your fridge. You can even add pasta to your soups to spruce them up. Just when you thought there was nothing for dinner, presto, you created a hearty and quick meal for your family. This is always helpful if you haven’t had time to hit the grocery store or if your budget is getting low. Can You Really Lose Weight by Eating Homemade Soups? Eating a bowl of soup as an appetizer is a great way to cut down on the calories. It leaves you feeling full before your main course so you eat less of the heavier foods. If you choose to make soup your main meal you can always make the meal more appealing by adding your favorite bread or some crackers on the side. Try a bowl for breakfast. Whether you are eating a bowl for breakfast, lunch or dinner, the more homemade soups you consume instead of heavier food choices, the less calories you will consume which leads to weight loss. Here are a few other benefits of soup that make a bowl at meal time more appealing. Since they are high in fiber and easy to digest they can help relieve constipation, poor digestion, and troubles with stomach acid. Soups are also a great way to maintain your healthy body weight. 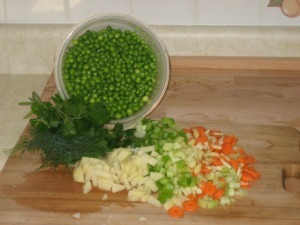 When making vegetable or legume soups, substitute homemade broth instead of adding water. Here’s why! True broths are rich in calcium, magnesium, potassium, phosphorus, collagen, gelatin, glucosamine, chondroitin, trace minerals and much more. Broth is beneficial for joint health, digestive problems, immune system, cold and flu, hair and nail strength and the list goes on. Bone broth in particular is an incredible tonic for bone health and the prevention of osteoporosis. There are several broth recipes you can choose from to make your soups healthier and even more delicious. How can I get my kids to eat soup? Click on this link Kids Eating Healthy for more information. Adjusting to a healthy lifestyle does take time and can be extremely challenging for children. But by eliminating more processed food you will slowly reap the benefits.